The SkyView Autopilot can now automatically keep the the aircraft in trim while under autopilot control, eliminating the need for the pilot to manually actuate their trim to satisfy the Autopilot’s built-in trim advice. This feature requires that the aircraft has an SV-AP-PANEL and is using its integrated trim controller for electric trim servo actuation. Auto-Trim can be configured on pitch and/or roll axes. 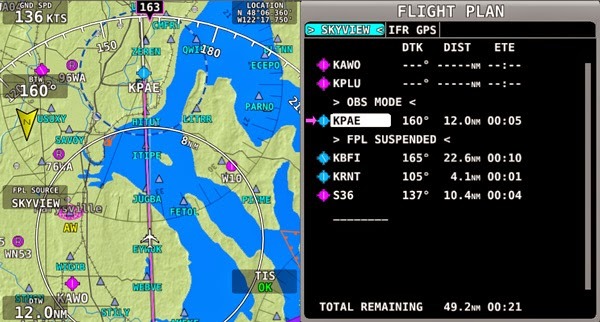 OBS Mode allows pilots easily set and adjust an inbound course to any navigable point on the map. That inbound course may then be easily adjusted with the HSI CRS knob, similar to how one chooses a VOR radial. This feature is useful to approach an airport from a specific direction, for example, without having to create a second waypoint to create a full flight plan leg. Pilots can essentially treat any point on the map as a “virtual VOR”. The aircraft icon displayed on the Map and in the HSI can be changed to one of over a dozen types of aircraft. 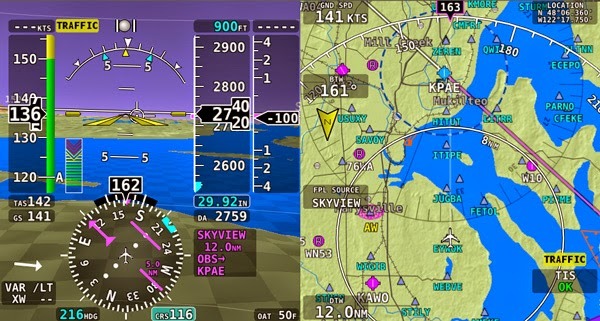 SkyView 12 also contains over 40 more improvements and fixes. See the full list here. As always, updated documentation is available, with red-line versions that capture the changes since version 10. There’s a full set of release notes that detail every feature, improvement, and bug fix.